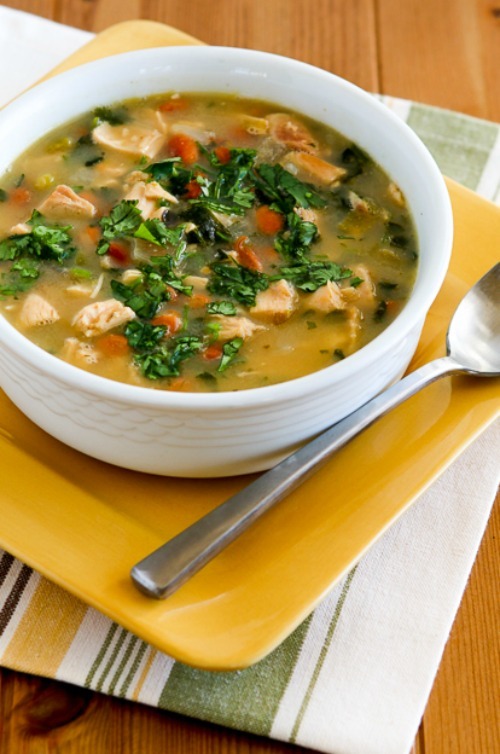 Chicken and Pinto Bean Soup with Lime and Cilantro is made from leftover rotisserie chicken! This easy and delicious soup is low-glycemic, dairy-free, gluten-free, and South Beach Diet friendly and it can be a low-carb soup if you omit the beans. Use the Diet-Type Index to find more recipes like this one. Click here to PIN this tasty Chicken and Pinto Bean Soup! This soup is a good one to make with leftover rotisserie chicken, and if you’re not a cilantro fan I’d use thinly sliced green onions instead. If you omit the beans this can be a tasty low-carb soup option. I sauteed the onions and garlic right in the soup pot, which saved dirtying another pan! Then add the chicken stock, dried Mexican oregano, ground cumin, and ground Chipotle powder or hot sauce and simmer for about 15 minutes to blend the flavors. Add the pinto beans with juice from the can, diced chicken, and 1/2 cup hummus or refried beans (to thicken the soup, optional). Let the soup simmer on low for about an hour. If you’re not a cilantro fan like I am, I’d use thinly sliced green onions to add some color to the soup. Chop the cilantro or green onions just before you’re ready to serve. Stir in the chopped cilantro or thinly sliced green onions, turn off the heat, and let soup sit for a minute or two to wilt the cilantro. Serve hot, with extra chopped cilantro and/or lime to add at the table. Soup Recipes from the Past! This Chicken and Pinto Bean Soup with Lime and Cilantro was first posted as part of a huge month-long collection of soup recipes at A Veggie Venture. Other soups I created for the month of soup included Lentil and Sausage Soup with Cabbage, Chicken Soup with Collard Greens, Carrots, and Brown Rice, and White Bean and Ham Soup with Chard. Chicken and Pinto Bean Soup with Lime and Cilantro is made from leftover rotisserie chicken, and is so easy to make! Heat olive oil in frying pan or in the soup pot, then saute onion 2-3 minutes. Add garlic and saute a couple of minutes more. In large soup pot combine homemade chicken stock, onions, garlic, oregano, ground cumin, and Chipotle chile powder and let simmer on low about 15 minutes. Add 2 cans pinto beans with juice, cooked chicken, diced green chiles, and hummus or refried beans (is using) and simmer one hour or a little longer, until flavors are well combined, and beans are quite soft. Turn off heat and stir in lime juice (I use my fresh-frozen lime juice) and chopped cilantro. Serve hot, with more chopped cilantro and lime juice to be added at the table if desired. Pinto beans are considered a “good” carb for South Beach and this Chicken and Pinto Bean Soup with Lime and Cilantro would be approved for all phases of the South Beach Diet. Although beans are a limited food for Phase One, in a soup like this with lots of other ingredients, you can have a regular sized serving. Pinto beans are too high in carbs for this to be suitable for most other low-carb eating plans, but you could make a more carb-conscious version of this by using more chicken and only one can of beans. Tammy I'm always happy when something is a hit with the kids! This was fantastic, thank you!! Even my kids enjoyed it. Thanks Lydia. There was definitely a lot of room for improvement. That soup really comes alive in the new photos! This looks so beautiful! I am warming up to cilantro — it took me a while, but it's growing splendidly in this garden and I want to better use it! Teresa and John, thanks for much for taking time to let me know you liked it! My husband and I made this for dinner tonight and wanted to let you know how much we loved it. This soup really hit the spot on a cold and rainy winter night. Thank you so much! Braden, thanks. You’re making me blush. Another winner from Kaylyn. I swear, you post the BEST recipes found anywhere. And your photographs are awesome too. Just another reason why you’re on my blogroll. Mimi, I think the diet is updated once in a while, so maybe you have an older edition. I know at one time they didn’t allow tomatoes on phase one but that was changed. Well, that’s a relief, Kalyn. I have the trade paperback version of the diet and there are some inconsistencies, I think. Mimi, I think skim milk is fine for phase one. My book just says to avoid whole milk or 2% milk. (I’m looking it up in the pocket guide.) Glad you like the recipe archives. If I had been smart enough to start this blog on a different blogging platform I could have saved myself a lot of work, but I do think it’s pretty easy to find things. You can also search by ingredient or recipe title. I can tell from my stats that a LOT of people who come here use the recipe archives. Anna, I love it when you call me brilliant. Seriously, it worked very well. Your addition of hummus to thicken the soup is brilliant! I’ll have to try that sometime! This looks wonderful! But what I really came over to tell you, Kalyn, how much I appreciate your recipe index. It is a lifesaver! I am on Day Three of Phase One. I am doing OK. The one thing I find I cannot go without, though, is skim milk. I’ll be featuring some of your recipes over the next week or so. Alanna, what a great collection of soups you’ve assembled. Blest, I would love that recipe for SB cheese biscuits if you have it. I buy hummus from Costco which stays good in the fridge for several months literally. I think homemade might spoil a little sooner, but it would be good for 2-3 weeks at least. Tanna, thanks. The hummus was a great addition. It seemed a little thin without out. I like the secret ingredient trick! and I love hummus! You are the soup queen!! The SB cheese biscuits would be a great complement to this too! Looks yummy! Question – how long does homemade hummus keep in the fridge, do you think? Yum, yumm! Thanks so much for another inspiring soup, Kalyn! I’m updating now so look for your link (and a half dozen others, they’re still coming in!) shortly.